Good news, everyone! Eccentric millionaire Barnabas Collins has pulled off another daring rescue mission, reaching all the way back into the late 19th century, to prevent angry ancestor Quentin from turning into a broken telephone. This heroic customer service call lasted six months, with time out to pick fights with grandmothers and fire demons and lawyers and crazy ex-girlfriends. Naturally, it all came down to a miraculous last-second save, which Barnabas had nothing to do with and doesn’t even know about yet. Quentin has passed through the ill-fated tenth of September and come out the other side, releasing the Collins family of 1969 from his terrible vengeance. Today is the first day of the rest of his life, which means we can all go home and celebrate by moving back into Collinwood, and finding a new monster to tangle with. Except we’re not going to, because the 1897 storyline is so much fun that we’re going to stick around for weeks. So now we have to face the question that always haunts long-running serialized narrative, namely: What happens to a story, when the story is over? Also, what are we going to do with Julia? She traveled back in time two episodes ago, using the power of LCD (lysergic Chinese divination). She was supposed to be the cavalry, riding in to take charge of the situation, but she had a pretty bad trip, and it knocked her flat. Now Julia’s lying in bed, unable to speak, and only using two facial expressions at a time, as opposed to her usual five. She only raises her head when Barnabas blocks her light, which is instinctual for all Grayson Hall characters and doesn’t necessarily mean anything. Suddenly, she starts emoting like mad, calling out to Carolyn and Elizabeth, who are apparently crying and running out of rooms. Barnabas listens to this for a while and then presents his diagnosis. This is why you let Barnabas do the mansplaining, because these plot points sound so much better when you can’t quite grasp what they’re actually getting at. I seriously can not get enough of that kind of thing. 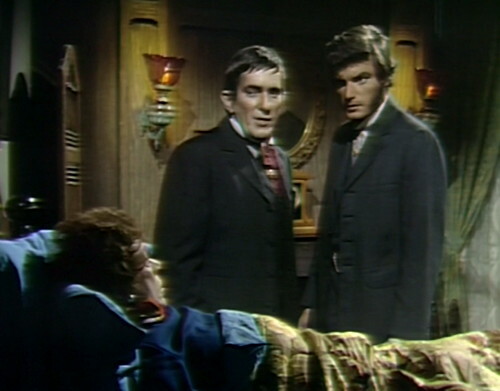 One day, April Third will come, and I’ll have to stop writing about Dark Shadows. This is what I will miss the most. And so we catch a ride on the magical meanwhiling tour, watching what’s currently happening in 1969, which is not what “currently” means. The vision is appropriately theatrical and avant-garde, another little slice of Off-Broadway black box theater. Roger sidles up to his dead son, and he says the most heartbreaking things. Which is, I mean. Try watching this scene without a little tear in your eye. It can’t be done. It’s one of those perfect dramatic moments, and it works even better because it’s sitting in the middle of the silliest plot points they can think of. And then David comes back to life, hooray! And he tells his awestruck father that the ghosts are gone, and he’s alive again. That means Barnabas has completed his mission, kind of, by accident and without actually doing anything. Now it’s okay for Julia to return to life as well. She revives, and Barnabas tells her, “It’s all right. You’re here with us, in the past.” This is one of the all-time non-reassuring reassurances. So that’s it, we’re done; everything at this point is just recap and retcon. Quentin says that nobody can come back to life, but Barnabas says, “Someone could! If the reason for David’s death was eliminated.” Don’t bother trying to work that one out logically; you might as well ask why they were holding David’s wake on stage at an NYU performance space. 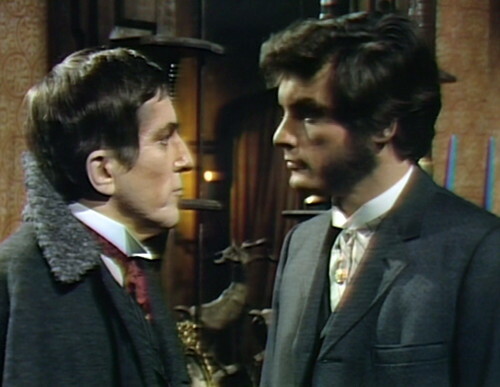 Barnabas points out that Jamison rejected Quentin last night, and now Quentin wants to make things right with his beloved nephew. But if Quentin had died on schedule, he wouldn’t be able to reconcile with Jamison, and his ghost would try to reconnect with David. “Then that means I have what no other man has ever had,” Quentin says, “a second chance.” I’m pretty sure that’s not correct, there must have been other people getting second chances. Quentin needs to check his math. But it’s a second chance for everyone, or maybe a third. 1897 has been renewed for another season, held over by popular demand. Following the initial structure for the storyline, it looked like they were planning to wrap things up around July, but Quentin was too much fun to let go of, so Magda unearthed a magical artifact that’s kept everybody spinning for the last few months. But they couldn’t keep putting off the resolution of Quentin’s death forever, so they handled that, and now we’re driving forward into an uncertain future. Bringing Julia back in time is the key to further storyline development. There are four essential characters — Barnabas, Julia, Quentin and Angelique. Now, for the first time, we have three of the four in one room, while the fourth is waiting for them at Collinwood. This is Dark Shadows’ best-case scenario. Quentin clears the room, so we can get down to the thing these two do best: explaining things to each other. As I said, Barnabas is irresistible when he’s walking through a tricky set of plot points, and Julia is equally skilled on the receiving end. He goes on for a minute about Chris and Lenore and Count Petofi, but the first big moment comes when he announces that everyone knows he’s a vampire. “And they’re — hunting you?” Julia says, and then delivers a big scarf-clutching gasp. The vampire hunt story has been dragging on for several months now, but Julia’s just learning about it, which makes it feel like a fresh new dilemma. This is what happens, when you get these two together. They can make tired plot contrivances feel new, just by reacting to them. 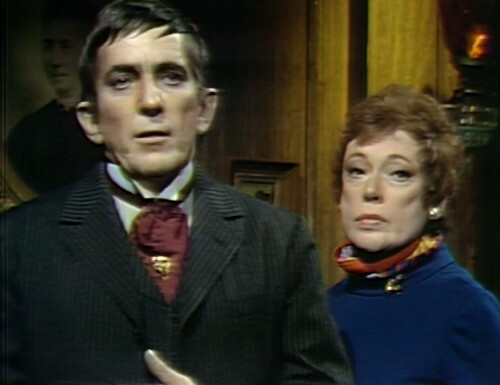 So they just keep barreling through, with Barnabas sounding serious and Julia making dramatic faces. They cover the night that Edward broke Barnabas’ I Ching trance, and made Barnabas’ physical body disappear in 1969. This is a cluster of complex story points which don’t really make much sense, so after a while, they both give up and just start reading things off the teleprompter. 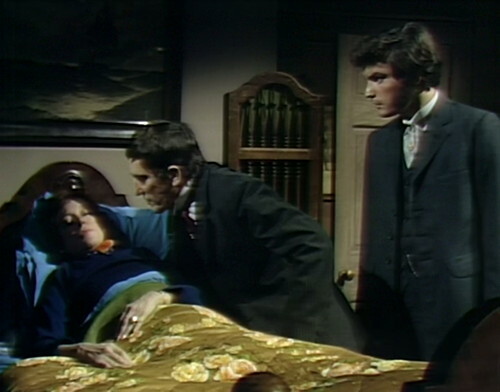 Julia wants them to return to their own time, but Barnabas emits a series of urgent noises. Get a load of this. So there they are, all the feels, just sitting there where you least expect them. It’s unbelievable that they kept Barnabas and Julia apart all these months. They need to not do that anymore. Yes, we’ve all had a good time falling in love with Quentin, and running around in the woods with gypsies and mad gods, but this particular smile is the heart of Dark Shadows, and it is irreplaceable. Moments later, or so it seems, Julia is preparing an injection that will cure Barnabas of being a vampire. She’s borrowed a dress, and a medical bag, and a brand-new imaginary backstory where she’s cured him before, using injections. This is not actually the case. Julia never really cured Barnabas in the first place, and when she tried, it involved a whole mad science apparatus, bubbling away to the hum of electric spark gaps. Barnabas was cured by taking some of his life force, and sticking it up somewhere that it didn’t belong. But now they’ve decided that Julia can restore the undead using a hypo full of chocolate phosphate, because she’s awesome and she can do anything. I agree with this assessment. 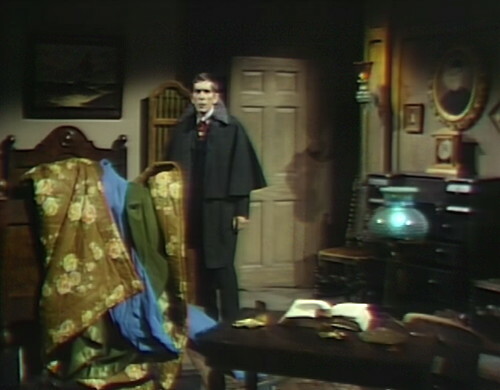 Then Barnabas charges off to Quentin’s room, where he tries to get to the bottom of the mystery of Quentin’s portrait, which is a whole other thing I haven’t even mentioned today. I kind of thought saving Quentin’s life was the end of the story, but now that they’re digging into it, there are even more secrets and betrayals and coincidences to unravel. The other night, Quentin didn’t change into a werewolf under the light of the full moon, and Barnabas wants to know why. Quentin just shrugs. “The gods laugh sometimes,” he says, and that’s all he has to offer. It’s just wonderful. Everyone is acting like turbocharged versions of themselves today, doing all their best bits, and making the case that we need to renew 1897 for another couple months. 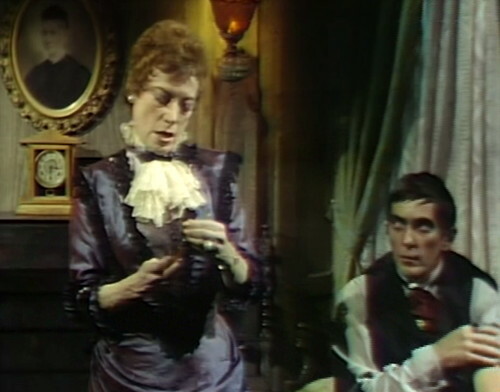 Then Barnabas goes back to the rectory, and guess what: Julia is gone, and the place is a shambles. You can’t beat a good shambles for dramatic value, it’s the set dressing equivalent of a car crash. It’s the most appropriate way to end this utterly inappropriate episode, and I love it. The gods do laugh sometimes, and when they manage to get things just right, then we laugh too. And we gasp, and cheer, and shed a tear. Stay tuned for whatever game show was brave enough to follow this. 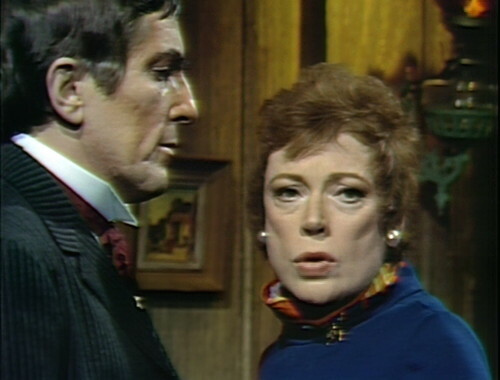 Barnabas tells Julia, “There is a certain lawyer — Evan Hanley. He practices the black arts. You will go to him as a member of the New York coven. And when you introduce yourself to him, he will — he will know you. He will be afraid not to do anything else.” He also mispronounces “coven”. This is a very dialogue-heavy episode for Barnabas, so you have to expect these kinds of things. The act break for act 2 is utterly tragic. Quentin holds his glass up — obviously intending to crush it in his fist — and he makes his big dramatic speech — and then he tries to crush it, and it doesn’t break. He just stands there and struggles with it. When Quentin tells Barnabas, “I also know he’s an enemy,” somebody coughs in the studio. He coughs again about ten seconds later. David Henesy is credited as Daniel Collins today, instead of David. 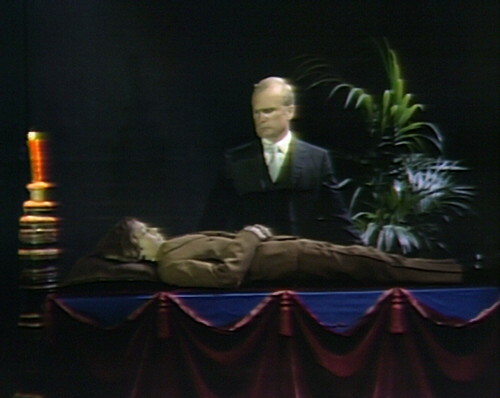 It’s a lucky thing that the Collins family has a “no embalming” clause on file at all the Collinsport funeral homes. This has come in handy twice now: with David in this episode, and with Elizabeth back in early ’69. Yeah, and the same for Vicki and Quentin. There are going to be some more examples coming up, too. It’s hard to read the phrase “the New York coven” without thinking of ROSEMARY’S BABY. I haven’t seen it in some time, but I know the Roman character’s father was also part of a New York one, and maybe during 1897 itself. If so, that would be another connection. 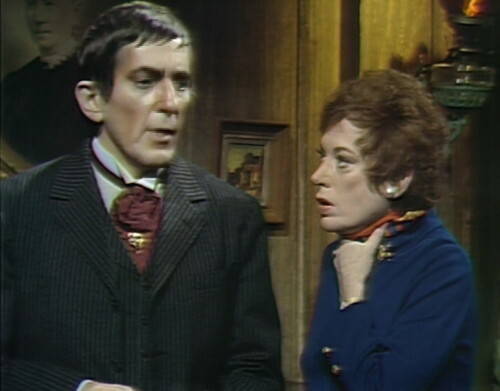 Barnabas tells Julia, “There is a certain lawyer — Evan Hanley. Humbert and Grayson played some of the most intelligent and witty characters in DS history. This truly was amissed opportunity to showcase both of them. Like you, when Barnabas sent Julia over to hoodwink Evan I thought if anyone can fool Evan, it’s Julia – this is gonna be GOOD. Humbert Allan Astredo must be doing a play during this time, he doesn’t appear again until towards the end of 1897. I was under the impression that the only reason Julia’s injections didn’t work in the 1960s was that Barnabas insisted on the overdose that turned him into a 200-year-old-looking man. Also comma how freaking grade is Louis Edmonds? All he has to do is walk on set to anchor the show back in some kind of reality. Exactly. I was also touched by Edward’s kind and very courtly treatment of Julia when she appeared collapsed outside his house in short skirt and hair. Louis can emote such genuine tenderness, I wish he wasn’t always playing harsh, unbending roles. One of his best moments was when Jason was blackmailing Liz into marriage. Roger was giving her Hell for giving Jason the cushy job at the cannery when Louis suddenly stopped and quietly and kindly asked, “Liz…can’t you tell me?” expressing in those few words the deep and abiding love Roger had for Liz. very nice point, Samantha. i’m touched by your capacity for the same. 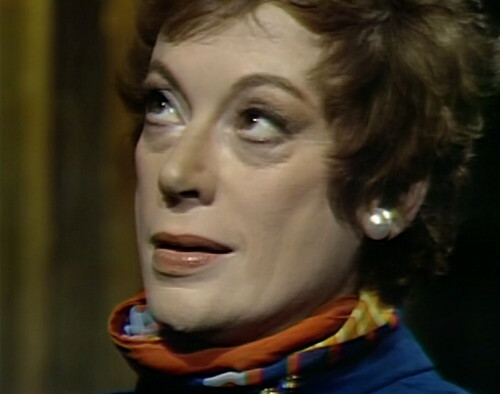 When Barnabas asked Julia to make it possible for him to live in the daytime again he may have been referring to Eric Lang’s treatment which was supposed to have been forwarded to Julia…. If they’re not stabbing furniture with letter openers, they’re crushing brandy glasses in their fists. This is Dark Shadows’ most frequently recurring and longest running dramatic physical stunt — the first to do it was Roger Collins in the Collinwood drawing room at the end of the very first act in episode 1 back in 1966. This must have been done in some movie that the writers or producer liked, and they liked it so much that they kept doing it year after year throughout the show’s run. You can count on Count Petofi joining in with the ritual glass crushing in an upcoming episode. I’ve always said Roger takes after his uncle Quentin. Great-uncle. But, then again, I always called my great-uncles “Uncle,” so it works. I like having Julia back too, but bummed that we never see Magda again. I remember hoping for a meeting of the two. I know they shot live to tape but one split screen would’ve been awesome. Magda will appear for a couple more times. When the show returns to 1969, it’s learned that the two did meet off camera. What if Barnabas had never gone back to 1897? Would Petofi have gotten his hand back sooner, left town and not taken enough of an interest in Quentin to save him? Re-engineering such an alternative plot would almost be like Hansel and Gretl retracing their steps after the bread crumbs have all been eaten, but it seems worth considering.